Maryland has a complex property assessment system - a third of all properties in each county are reassessed every year. 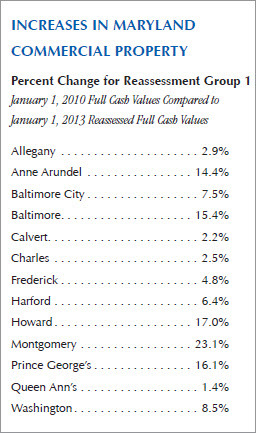 Numbers from the recently released in-cycle 2013 assessments show values have increased in the majority of counties and the City of Baltimore (see chart below). The largest increases were reported in the urban center counties. The deadline to appeal a proposed valuation is 45 days from the date of the assessment notice. Any increase in property value is phased in equally over a three-year period. Any decrease in property value as the result of an appeal will render tax savings for the next three years. The assessment only partially determines a property owner's tax bill. Ultimately, next July's tax bill will be calculated with the tax rates that local governments will set in the spring.